"Dear Monsieur Haase, The pen arrived yesterday and is already the instrument responsible of a long letter. What a difference! It worked beautifully and kept up with my fast handwriting, the first pen to do so! The experience of ordering from you was very agreeable but has to potential of being addictive. Thank you again." 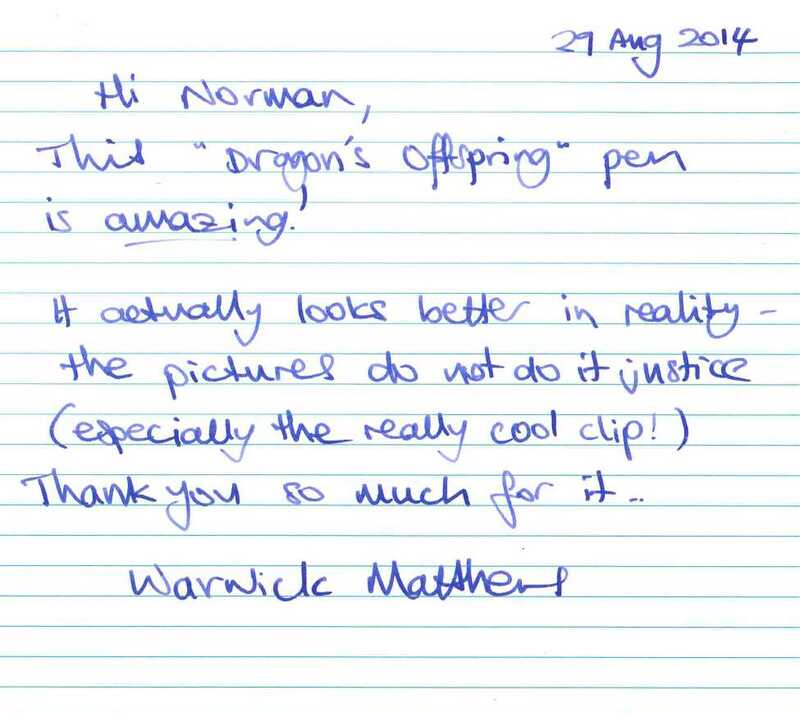 "Norman, thanks so much for the Dragon's Offspring pen. It writes beautifully - I am a Mont Blanc man, and I have learned to like the Monteverde nibs (although I find they have a little less give than MB). This pen is very different, it "skates" better than any I've owned - I love it!!!!" "Just a quick note to let you know that my pens arrived this morning. I have to say that these are stunning pens. After my initial excitement the first words I breathed were, “these are gorgeous pens, simply gorgeous”. I also feel that the oversized nibs add to the elegance and grandeur of these pens. I can hardly wait to flush and ink them up. Just as in my previous order, I am sure they will write beautifully. Again, thank you Norman for your wonderful service and attentiveness." "I love the Dragon's Offspring pen that my wife got me for my birthday this fall. It writes beautifully, looks gorgeous, and as we've just welcomed our third child into the world during the Year of the Dragon, it's already got great sentimental value (I wrote a letter to our new son as we settled into the delivery room using that pen). Thanks as always for such outstanding service with great pens & materials." "I'm thrilled. You can even use an image if you want. I love that pen. It's made it into the second week of rotation -- even my favorite pens get 1 week on the rotation. I just like it too much to rotate it out." 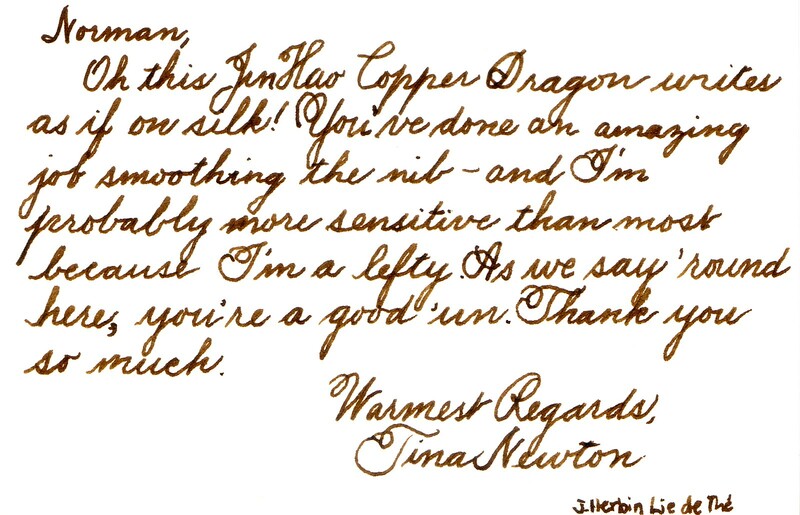 "Seems that I’ve lost one of my Jinhao pens (Dragon’s Offspring Copper). The real problem is that I feel it writes better than most of my much more expensive pens. So, please order me another (and I’ll see whether it arrives before I find it). Ha...the two most highly regarded of my writing pens are one of my very fine Cross pens and the other is the Copper Dragon. Amazing, and I’m a lefty as well!" "Hi Norman I got the pen, and I love it more than the last pen. The weight is perfect the balance is perfect the nib looked too big at first blush but after writing with it I don't think I will write with any other pen. There aren't enough words to describe how much I like this pen." "...But when I picked up and started writing with the Dragon’s Offspring, well there was just no comparison. The Dragon’s Offspring (DO) is so creamy smooth. 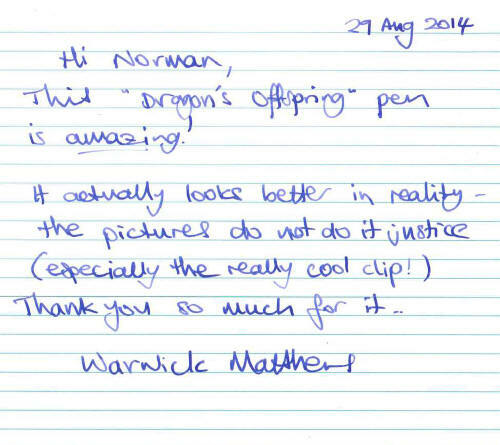 I don’t think that I have ever written with a smoother pen...The Dragon's Offspring is truly a beautiful pen and is a delight when the nib is gliding across a sheet of paper." 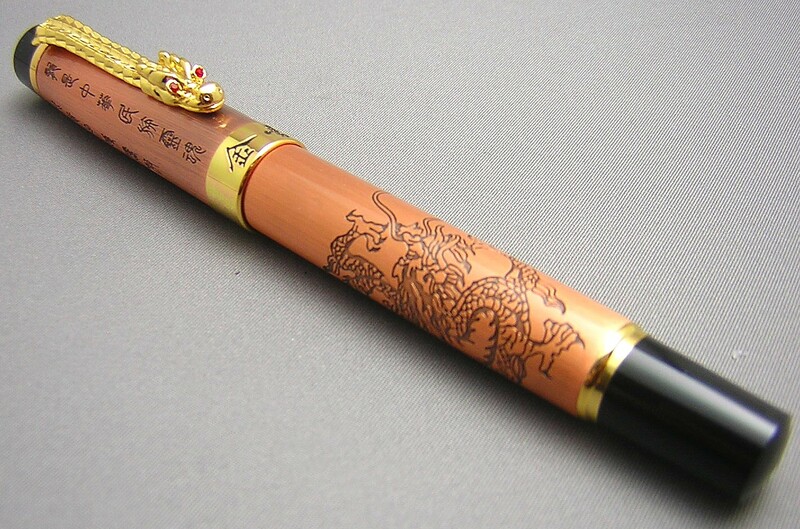 Dragon's offspring is a self-referential name for China and the Chinese people, and this copper-over-brass pen captures that spirit beautifully. As my wife Lai Yee translated the characters from the cap, the essence is that the dragon is the soul of the celestial tribe (China)...and we are proud to meld with the gifts of nature. 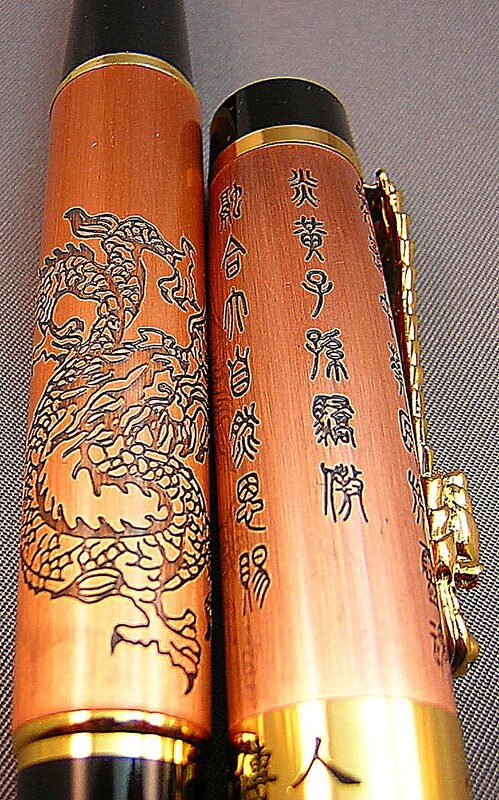 The characters for Jinhao and Dragon's Offspring are also etched on the cap and the cap band. It's a full-sized pen from Jinhao with a terrific oversized nib. It measures 5-1/2" capped, 6-1/2" posted and 4-7/8" with cap held aside. Although the pen has a bit of heft to it, it's not an overly heavy pen, so can certainly be used for extended writing sessions, with cap posted or not. 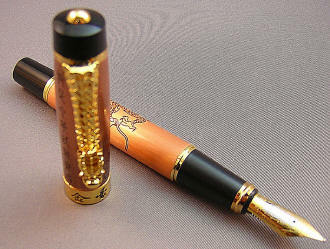 Copper has a wonderful appearance for a fountain pen. It's also a bit difficult to miss the sinuous dragon etched into the barrel or the dragon clip with it's glowing red eyes! The design cue adorning the top of the cap, which evokes the pinnacle of many Chinese temples, is rendered with a golden 'jewel'. Removing the cap displays another lovely, two-toned oversized nib from Jinhao. 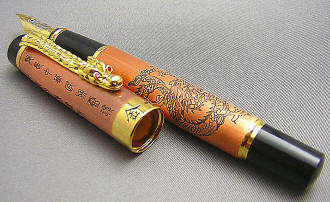 In this case it's decorated with a dragon's head, the Chinese characters for Jinhao and 18K GP (gold-plated). I adjudge this nib to be equivalent to a western medium, still somewhat of a rarity for a Chinese nib, although found on the Evening Stripes and the Plasma. Sometimes the regular Jinhao nib is sent instead. I have no control over this, and it varies from order-to-order. Unscrewing the barrel reveals the piston converter for bottled ink...but with a twist (pun intended). The converter is also finished in copper! It will also take International-style cartridges, such as those from Private Reserve. As with all new pens, I recommend to run a dilute solution of dishwashing soap (two or three drops to a small bowl of water) through a new pen a few times, followed by water only. Step one is effective at removing manufacturing oils that can tend to make the ink less than enthusiastic in heading from the converter/filler to the nib, and step two removes the traces of the detergent you've used...which tends to have the opposite, diuretic effect. A gift box is included.